In the third century, Tertullian wrote that the blood of the martyrs is seed for the Church. It was seed that God planted from the beginning. St. Paul endured imprisonments, beatings, stoning; St. John was exiled on the island of Patmos; St. Peter was allegedly crucified upside down. It all began with Stephen. Surely his acute view of reality buffered Stephen's agony as stones were hurled at him. He was given grace appropriate to the situation, just at the moment he needed it. I like to remember this. When I face a trial, God is there. He gives me just the glimpse of Him that I need, exactly when I need it. I know this through faith, and I know it from experience. God stands ready with what I need. I have never been pelted with physical stones, but I've endured a few pebbles. Smirks and snubs for living and speaking the truth of God. I like to remember that Jesus told us to expect nothing less. "You will be hated by all on account of Me." (Matthew 10:22). I pray to remember the example of Stephen. What a grace that the words of this first Christian martyr were written down: leaving, in effect, a pattern for all who would come after him. He looked at God, not at the situation. He prayed. He forgave. And his actions were witnessed by one who would turn, in time, to God. Stephen's pattern for dealing with stones is just as much a pattern for the pebbles. And God stands ready with what we need. I was struck this year by the words in Acts about Saul. He's really guilty here. Those who were throwing stones laid their cloaks at his feet. Like "hey Saul, hold my coat while I stone this guy!" Amazing that he could convert from wimpy collaborator to Apostle of the Gentiles! It is amazing, isn't it, Jamie!? Caroline, I hope to remember LRPF! Thank you! "He gives me just the glimpse of Him that I need, exactly when I need it." These are the words which struck me the most. Struck? 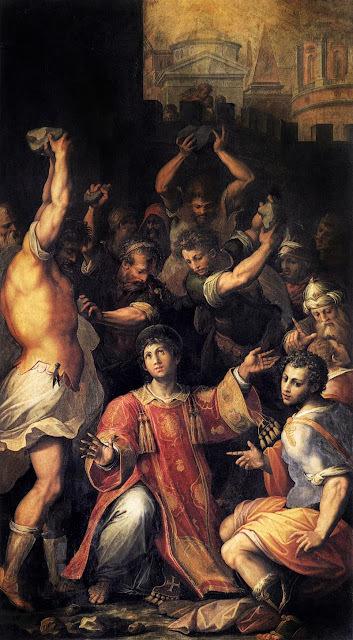 I'd rather be struck by your words than stones like St Stephen! Thank you, Sue. I am suddenly aware of how often I speak of something striking me!